Deputy Trade and Industry Minister, Carlos Ahenkorah has asserted that Ghana’s export promotion strategy is currently in disarray due to inadequate support from the Ghana Export Import (EXIM) Bank. Speaking at the 78th National Exporters’ Forum at Ghana Shippers’ House in Accra, Mr. Ahenkorah said the situation exists because EXIM Bank is not under the right ministry that would ensure and supervise export promotional activities in terms of financing. According to him, the continuous promotion of non-traditional export will be meaningless unless government realigns activities of the EXIM Bank to export promotion. 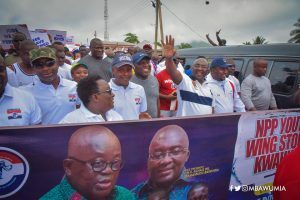 He lamented, “Until this is done, I’m sure that we would sit and promote exports in Ghana and will not find that results that we’re looking for”. Mr. Ahenkorah, therefore, wants Ghana EXIM Bank to be under the Ministry of Trade and Industry and not the Finance Ministry because he believes that would provide the needed support to develop the export sector. “We came into government to inherit a new law or act that establishes the EXIM Bank that took away the export development fund away from the Ministry of Trade to set up this bank, but is not under the Ministry of Trade but under another Ministry,” he said. The Deputy Trade Minister also charged the Ghana Investment Promotion Centre (GIPC) and the Ghana Exports Promotion Authority (GEPA) to establish impact hubs across the country for start-ups which may be interested in venturing into the export business. According to him, most start-ups are faced with several challenges when it comes to funding their businesses, therefore, it would be prudent GIPC and GEPA take up the responsibility by creating export hubs in every district where the start-ups can have access to these facilities to negotiate their businesses. The 78th National Exporters' Forum witnessed the launch of a new portal that will be used to facilitate imports and exports by bringing together buyers and sellers to interact. The Buyer Portal of the GEPA Market Hub as it was named also contains all exporters and companies recognised by Ghana Exports Promotion Authority and contain information on every organisation signed up with them. The portal can be accessed from any device and its user friendly.